Made in Italy. Volume production started in late 1965. Distinctive features: The first stored-program desktop calculator. Capabilities - 4-function, square root, branching instructions. Programs can be stored and read using magnetic cards. Display - Results printed on listing paper. Photographed at the National Museum of Computing, Bletchley Park, U.K. 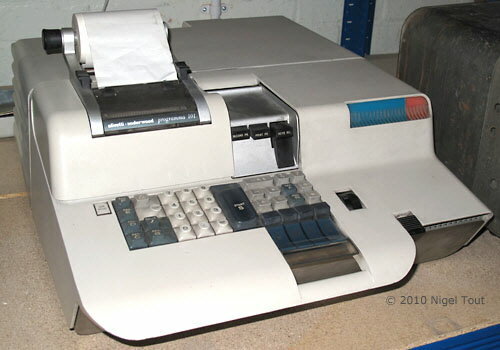 The printer, card reader/recorder, and keyboard of the programma 101. ... Now comes a new breed: the Programma 101, the first desk-top calculator that has some characteristics of a computer. 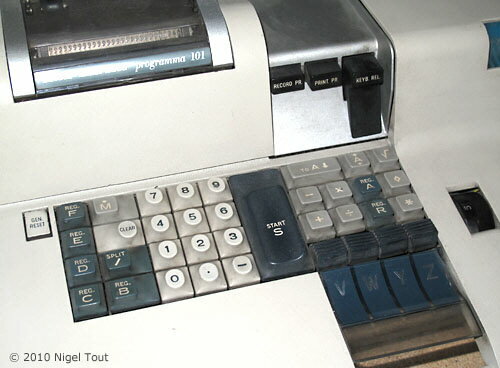 The 101 is the first member of a family of computer-calculator machines that its producer, Ing. C. Olivetti & Co., S.p.A., of Italy, hopes to introduce. Two out of three. The programma 101 exhibits two of the three characteristics that distinguish a general-purpose digital computer from a desk calculator: it can operate on a stored program, and one of its instructions is a conditional branch—that is, an instruction to itself can depend upon the results of a previous instruction. What the Programma 101 lacks is the ability to operate on instructions in the same way as on data; for example, the calculator cannot alter its own program as it goes along. The stored program can be entered from the keyboard; it can be recorded on a card much the same as on magnetic tape. Later, it can be reentered into the machine from the card. A card contains two programs, one at either end, each with as many as 120 instructions. This machine lacks another ability of a large computer: the capacity to store up data in advance. Data must be entered manually through the keyboard. Rat-tat-tat. The Programma contains 10 registers, each with a capacity of 22 digits, plus sign and decimal point. Its printed output is produced by a flying-drum printer. The drum rotates continuously; a hammer, sliding across it, prints a character for each print position as it goes by. This and the card feed are the only non-electronic parts of the machine, and the printer is the only noisy part-the hammer makes a rat-tat-tat as it bangs out the characters at a 30-per-second rate. The noise is made by the paper; without paper, the printer is almost noiseless. The company is secretive about how the machine works and about details of its electronics. A spokesman says, however, that it contains discrete components. Company officials say they are keeping close watch on progress in integrated circuits and will consider IC's in future models if the circuits are priced low enough. There is speculation that the registers are made of some kind of ultrasonic delay line, because flip-flop would be expensive and bulky and it would not be economical to build a ferrite-core memory of only 1,000 bits or so. The magnetic cards for recording programs are 2¾ by 9½ inches and can hold one 120-step program at each end. The recording format or method of encoding are not disclosed, but this much program would fit on less than an inch of magnetic tape. Olivetti says the program occupies only 15% of the space on the magnetic card. The Programma 101 is 7½ inches high, 19 inches wide, and 24 inches deep. It weighs 65 pounds and sells for $3,200. Full-scale production started Oct. 1, officials say, and deliveries are expected to begin in January of February. ..."
The programma 101 was a remarkable achievement using the discrete transistor technology of the time - there are no integrated circuits. It was developed by a small team led by the Italian engineer Pier Giorgio Perotto. The cost of $3,200 can be translated to 2015, due to inflation, as approximately $24,000 (about £15,500 GBP). "Desk-top Computer", Electronics, Nov. 1 1965.